Manutec presents a new range of 16” gauge wheels to suit John Deere Max Emerge twin disc openers and single disc openers. The new Manutec Mud Razor gauge wheels are also compatible with other brands utilising the 5203KYY2/3 bearings running on 16mm (5/8TH) shafts. The new wheels feature a split-spoked rim design with a semi-hard Duro rubber tyre with pneumatic performance. Various hub options are also available. Available in a tyre width of 110mm, each wheel will have its own fully sealed 5 stud hub running dual 6205 bearing, or single 6305 bearing or a 3 stud hub with 5203KYY3 bearing. Manutec’s aftermarket replacement gauge wheels are designed to suit John Deere models 1560, 1565, 1590, 1700, 1730, 1860 and 1890. Specifically designed to operate in Australian conditions as well as reduce the through-life maintenance costs associated with these types of wheels, the new 16” Manutec Mud Razor gauge wheels can be fitted straight on to any machine that currently has wheels fitted with the 5203KYY2/3 bearing, similar to the John Deere machines. Rims, tyres and hubs have been specifically designed to allow fitment to the John Deere Max Emerge disc openers. 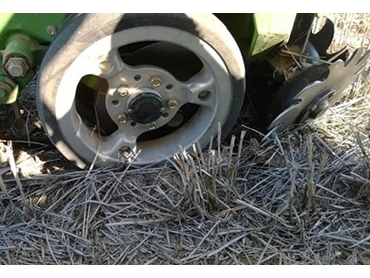 Key advantages of the new gauge wheels include harder Duro reading for increased durability; spoked rims to allow flow of residual mud and trash through the rim to further reduce plugging; hard tyre for increased wear resistance to hard stubble tyre damage; aluminium rim for reduced weight, decreasing wear on other componentry; tyre designed to reduce compaction of soil along the disc cut; and choice of multiple mounting options. Early ordering is advised due to high demand for the new gauge wheels. The new 16” replacement press wheel rims and tyres for the John Deere 1870 Conservapak are also now in stock. A complete replacement wheel plus bushing is now in stock.